Opportunities for students interested in the performing arts are available both inside and outside the classroom. 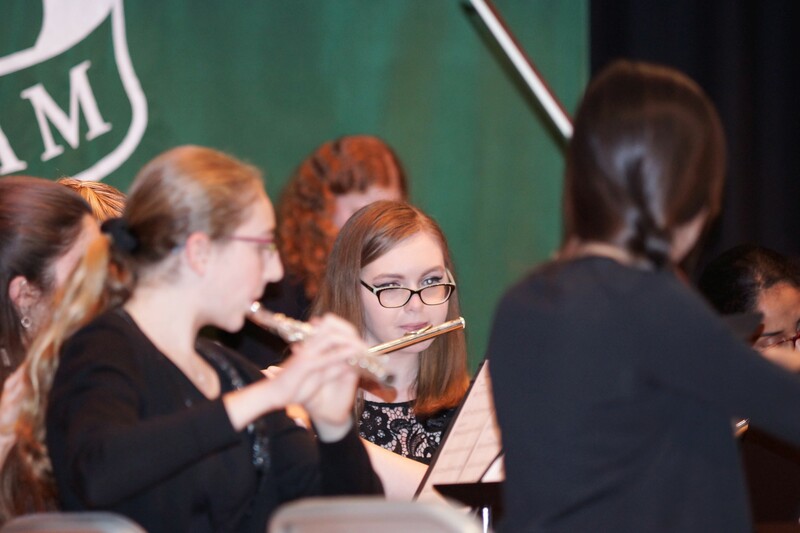 From electives in Music Theory and Musical Theater, to drama performances, to an array of choral and instrumental ensembles, there are a variety of ways for students to fulfill and develop their creative talents. Ursuline Academy presents three performances a year: one musical and two plays. The past few years have featured performances of The Sound of Music, Seussical, A Midsummer Night's Dream and Much Ado About Nothing. Partnerships with local boys schools provide opportunities for coed performances. Ursuline has three choral ensembles to suit the skill level and musical interests of a range of students. Glee Club - The Glee Club meets throughout the year in preparation for two performances: the Christmas Gathering and the Spring Festival of the Arts. Any student in grades 7-12 who enjoys singing is encouraged to join. Choral Group - This group is an important part of the monthly religious services and performs at numerous events throughout the year. It is open by audition to students in grades 9-12. Bearitones - The Bearitones are a student-run a cappella group. They perform several times a year, and in 2016 organized their first a cappella festival with surrounding schools. The Chamber Ensemble welcomes intermediate and advanced musicians (string, woodwind, brass, or percussion) in grades 7 through 12 . The ensemble practices in the evening and performs at the Christmas Gathering, the Spring Festival of the Arts and at other special events. The Liturgical/Lyrical Dance group is composed of students with some ballet training and/or who are currently studying ballet. In addition to sharing their talents at Mass in liturgical dance, these young women perform lyrical dance at the Christmas Gathering and Spring Festival of the Arts. The speech team is an eclectic, talented and enthusiastic group of young women who practice weekly and compete in regional speech and debate events. Experienced students on the team act as coaches for the newer students. In addition to these opportunities, new clubs are formed each year based on student interest. A sampling of recent offerings include Pop Culture Club and Stagecraft. Ursuline students shine in the performing arts! The Choral Group earned a silver medal at the 2018 Massachusetts Instrumental and Choral Conductors Association's (MICCA) Festival, the group's second medal in as many years. Cara DiPietro '17 received an All Star Acting Award at the 2016 Massachusetts Educational Drama Festival for her portrayal of Muriel Tate in Xaverian Brothers High School's performance of Plaza Suite. Congratulations to the Ursuline Speech Team on their success at State Finals in 2018, where the team took 6th place overall of 28 schools. Team members Maddie Mullen '19 and Mary Kate McDonald '20 competed in the National Catholic Forensic League tournament in Washington D.C. Mary Kate McDonald made it to quarter-finals (top 24 out of nearly 400 competitors!) in Oral Interpretation. The Speech Team won the Lincoln Sudbury Small School Sweepstakes Tournament for two years in a row, and placed 10th out of 50 in the Holly Festival Tournament Sweepstakes in 2015-16. In other highlights, all team members qualified for the 2015-16 state tournament; Maggie Chipman '17 competed in the NCFL National Tournament for three years; and Chipman, Cara DiPietro '17, Meg Johnson '17, and Brittany O’Malley '16 were TV News Team tournament champions at the 2015-16 Holly Festival.